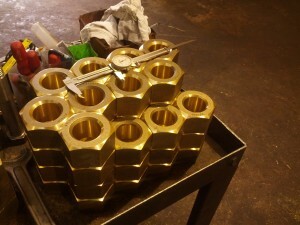 Atlanta Rod manufactures 360 Brass hex bolts, nuts, and studs to your custom specifications, and we guarantee to meet your delivery schedule. Copper Alloy No. C36000 (“Alloy 360” or “360 Brass”), is a standard alloy consisting of copper and zinc which contains about three percent lead. 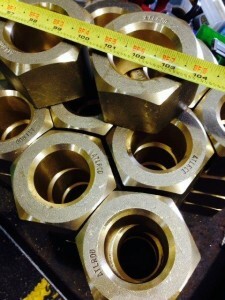 Smaller amounts of lead gives 360 Brass a very desirable level of machinability. The 60-40 mixture of Copper and Zinc forms an alloy with good strength and corrosion resistance. 360 Brass, known for its strength and resistance to corrosion with properties closely resembling that of steel, is one of the most popular copper alloys used today. Although ductile in its softened state, 360 Brass is a strong material to work with and maintains its strength even under some of the most demanding conditions. 360 Brass has a wide range of applications, such as screw machine parts, couplings, bushings, connectors, fittings, nuts, bolts, valve stems and valve components, pump shafts, brackets and many more.